“It’s like another world,” Helen Farr from the expedition told the BBC. The vessel was one of many tracking between the Mediterranean and Greek colonies on the Black Sea coast. As yet the ship’s cargo remains unknown and the team say they need more funding if they are to return to the site. “Normally we find amphorae and can guess where it’s come from, but with this it’s still in the hold,” said Dr Farr. 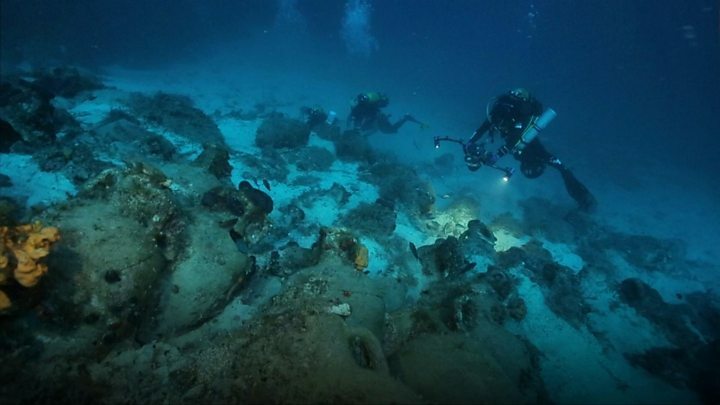 Media captionDozens of shipwrecks in the Aegean reveal a new story about ancient seafarers.